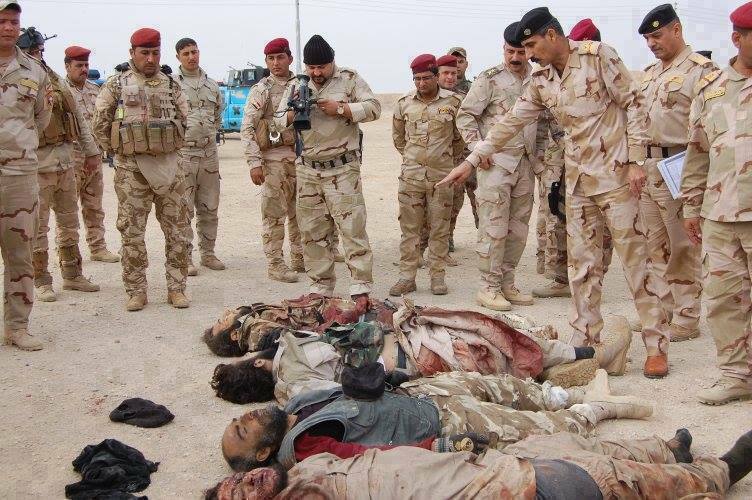 JNN 05 April 2014 Baghdad : Iraqi security forces killed more than 40 Wahabi Terrorists on Thursday in clashes in a town southwest of Baghdad, the interior ministry said in a statement. The firefight in the town of Yusifiyah also left one army officer dead, the statement said, adding that two heavy machineguns, 15 rifles and five grenade launchers were seized, along with other equipment. “Iraqi security forces confronted a failed attempt by Daash gang members to break into a military camp,” the statement said, referring to the Arabic abbreviation for the powerful Islamic State of Iraq and the Levant terrorist group. The clashes in Yusifiyah come after days of fighting in the Zoba and Zaidan areas west of Baghdad, spurring concerns that militants who have for months controlled the town of Fallujah could be looking to open a new front to encroach on the capital. Elsewhere Thursday, a series of attacks nationwide, including five car bombs, killed 10 people, security and medical officials said. A car bomb near the restive ethnically mixed northern town of Tuz Khurmatu killed four soldiers and wounded 12, while another car bomb in Hilla, south of the capital, killed two more. Three car bombs elsewhere south of Baghdad killed three people, while gunmen killed another in Tikrit, north of the capital. More than 2,300 people have been killed in Iraq so far this year, with unrest at its highest level since 2008 when the country was emerging from a brutal sectarianism , Infested by the Saudi and US Led forces , that left tens of thousands dead. The bloodletting has been principally driven by the sectarianism Infested Mainly by the Saudi sponsored Agents ,which are giving rise to sectarianism , and are trying to Infuriate the Sunni Arab minority by making them realize that as in the Saddam Era they were Absolute Authority even being Minority , but now after the fall of Saddam Hussain as the Democratic Government has taken over , and due to Shiite Majority the Government is automatically Shiite-led government and security forces, while at the same time Billions of Dollars are being Invested by the Saudi Government to fuel Sectarianism , which is also being fanned across the Border in neighboring Syria. But as the General Elections are also Near , So again Huge funds are being funneled by Saudi Wahabi Monarchy , to create sectarianism , and to divide Iraq on Sectarian and Ethnic lines, while the Common Iraqi is not interested in ethinic or Sectarian grounds as they are More concerned about , security , Economy, and Their welfare , So they can live in Peace and Harmony, But due to Injected Huge funds terrorist are trying to create Chaos and Anarchy , and the security situation has worsened upto a Limit . This entry was posted in Iraq News and tagged Baghdad, Iraqi security forces, Islamic State of Iraq, Saudi Wahabi Monarchy, security forces, Wahabi. Bookmark the permalink. To Jafria News Today at 12:39 AM WHAT A HEART WARMING NEWS . IT IS NOT 40 HUMAN BEINGS KILLED , IT IS 40 WAHABIS SENT WASIL E JAHANNUM . IF IRAQ, BAHRAIN, SYRIA LABNON AND IRANIAN FORCES COME TOGATHER , THEY CAN IN FACT GET RID OF THE EVIL FORCES OF WAHABISM WHO ARE COMMON ENEMIES OF ALL SECTIONS OF ISLAM AND COULD LIBERATE THE HOLIEST OF HOLY PLACES OF ISLAM THE MAKKAH AND MADINAH FROM THE INFIDEL ZIONISTS .